Founders of India’s largest and best-funded internet and digital technology firms took home an average hike of 20% in gross remuneration for the financial year 2016-17, according to a TechCircle study based on the latest available regulatory filings. This is double the average pay hike in the country, which has been hovering around 9-10% for the past several years and also more than the 14% average hike in compensation for the highest-paid executives in the country that year (click here for the list of highest-paid executives of listed companies in 2016-17). The study covered two dozen Indian startups in which venture capital firms had pumped in the most money, as well as a handful of listed internet companies. While some large firms such as Flipkart, InMobi, MakeMyTrip and Yatra did not provide detailed disclosures of executive pay, the study captured most of the unicorns - startups with a valuation of more than $1 billion - as well as those that are nearing that mark, among others. 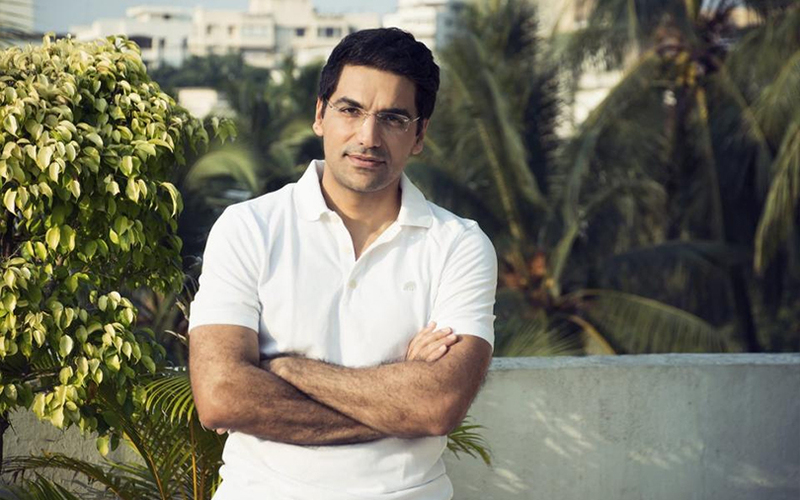 Pranay Chulet, co-founder and chief executive of Bengaluru-based online classifieds venture Quikr, pocketed the highest amount for the second year running. At Rs 6.35 crore, he was way ahead of Paytm’s Vijay Shekhar Sharma (see chart), among other industry peers. To be fair, he topped the remuneration charts thanks to stock-based compensation of Rs 4 crore in 2016-17. Moreover, his total remuneration actually declined by a third from the previous year when he had pocketed almost twice in stock compensation, but almost the same cash compensation. Interestingly, Quikr had the second-lowest revenue in 2016-17 among unicorns. It was only ahead of messaging service Hike, which had given up its revenue streams altogether. 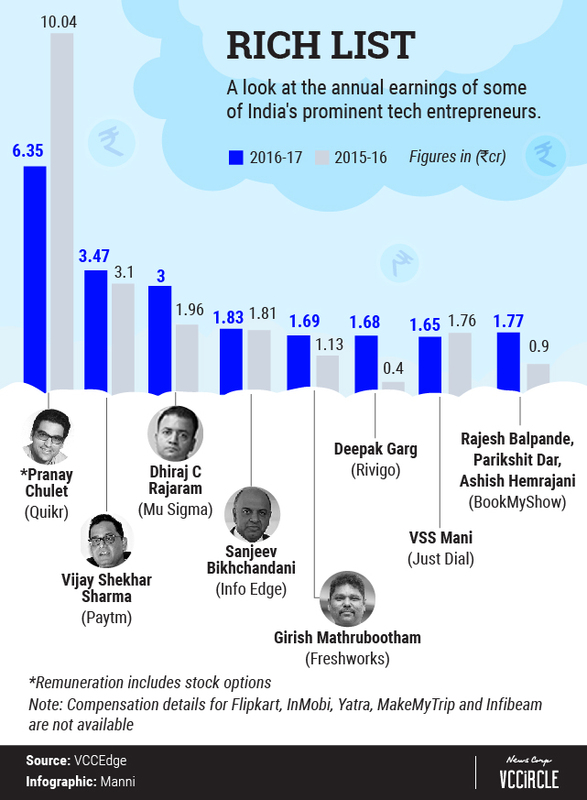 Paytm’s Sharma, who got a 12% hike that year, tops the list of techpreneurs in terms of cash compensation. Two entrepreneurs of publicly listed firms - Sanjeev Bikhchandani of Info Edge (India), which runs job portal Naukri.com, and VSS Mani of online classifieds firm Just Dial, also found places in the top 10. The others who figure in the top ten include MuSigma’s Dhiraj Rajaram, the three co-founders of online ticketing platform BookMyShow - Ashish Hemrajani, Parikshit Dhar and Rajesh Balpande, who had the same pay packet of Rs 1.77 crore each; Girish Mathrubootham of Chennai-based SaaS firm Freshworks (formerly Freshdesk) and Deepak Garg of tech-enabled logistics firm Rivigo. Rivigo’s Garg saw his remuneration quadruple to Rs 1.68 crore, topping the charts among his peers in terms of the sharpest jump in pay. Among others who saw around 50% or higher increase in compensation include the founders of BookMyShow, MuSigma, Freshworks, BlackBuck, UrbanClap, OYO, Zivame and Swiggy. However, most of these hikes have been from a low base. So much so, that even after a sharp spike, the founders of OYO, Swiggy, Zivame, Blackbuck and UrbanClap did not hit the Rs 1 crore-mark. UrbanClap’s Abhiraj Bhal, Varun Khaitan and Raghav Chandra took home just Rs 15 lakh each while OYO’s Ritesh Agarwal pocketed Rs 49.2 lakh. Other prominent names who took home over Rs 1 crore include FirstCry’s Supam Maheshwari, Hike’s Kavin Bharti Mittal, Lenskart’s Peyush Bansal, Bharat Matrimony’s Murugavel Janakiraman, Pine Labs’ Lokvir Kapoor and PolicyBazaar’s Yashish Dahiya and Alok Bansal. Barring FirstCry’s Maheshwari and Lenskart’s Bansal who received a 42% pay hike and 8% cut in remuneration, respectively, others in this set went home with 10-14% hikes. While few hit home runs with high pay hikes, there is a group of techpreneurs that voluntarily decided to forego their pay altogether. This list includes Snapdeal co-founders Kunal Bahl and Rohit Bansal, who didn’t take salaries in 2016-17. Thiswas even before the failed attempt to sew a deal with Flipkart and at a time when the company had started feeling the pinch and was laying off people. Interesting, Zomato’s co-founder and chief executive Deepinder Goyal also did not take a salary “voluntarily” in 2016-17, while his partner Pankaj Chaddah took a 33% pay cut that year. Chaddah left Zomato in March this year. One prominent duo missing among the table-toppers is Ola’s co-founders Bhavish Aggarwal and Ankit Bhati, who took home the same salary in 2016-17 as the previous fiscal - Rs 39.8 lakh. They remained the lowest paid (among those who did get paid) founders of unicorns. An Ola spokesperson declined to comment on the subject. They even figured lower in the pay chart compared to founders of other prominent ventures such as BigBasket, Byju’s, Practo and ShopClues. Emails sent to several of the above-mentioned companies seeking comment did not elicit a response till the time of publishing this report. TechCircle will update the story accordingly as and when responses are received. Some of these companies declined comment.